Hello Everybody. The second month of new year has started. We were wondering if you have bought yourselves a good calendar or not to keep up with all important days and occassions. Well, do you remember Paytm gave a free calender in 2015. 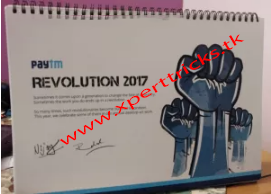 They are back again with same offer and this time, calender theme is “Revolution 2017” indicating the revolution that PayTM is trying to bring in digital payments. Hurry up and get your free copy now by making use of the below mentioned steps. How to get free Calendar from PayTM ? 3. In the mail write – Hi, I support Revolution 2017 and would love to get a calendar based on the same. 5. That’s it you are done !! Now just wait and you will get free paytm calendar at your home.